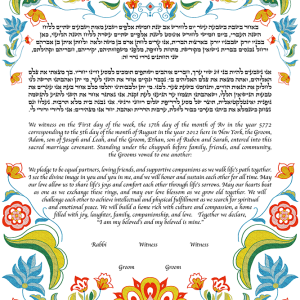 The Swedish Ketubah contains the best of classic Swedish folk art — lively design, floral prints, and lots of color! 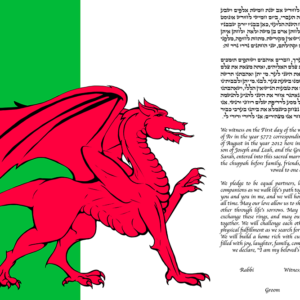 This Ketubah contains a simple white background with the text in the middle. The ornate flowers create the perfect framing at the top and bottom of the design — bringing movement and emphasis to the Ketubah text. This Ketubah is perfect for the couple that loves Swedish art and style! The vibrant colors and lively design truly bring this Ketubah to life. The Swedish Ketubah will be a beautiful representation of your marriage and tradition — a work of art that will fill you with warmth and love for years to come! Bursting with color and style, this Ketubah is perfect for the whimsical at heart! The Whimsical Ketubah contains tons of overlapping swirls and lines — creating a gorgeous design with depth and detail. The gradient colors capture the warmth and beauty of summer, ranging from deep pink and red to soft yellow and orange. The Whimsical Ketubah is perfect for the couple that is a little more on the quirky side, and isn’t afraid to let that show in their Ketubah! Between the vibrant color palette and unique design, this work of art is truly bursting with life and energy. This Ketubah will be a stunning symbol of your love and relationship — full of tradition, color, and excitement! No matter if it’s the sun breaking over the buildings revealing a new day, or the dazzling lights and electricity of the night, no one can deny: there’s something completely magical about a city skyline! Part of our Skyline Series, The Cincinnati Skyline Ketubah reflects the reverence for your favorite city and blends it with the soul of the Ketubah tradition. This gorgeous work of art captures all the pride and beauty of seeing that favorite skyline from afar — whether it’s from your bedroom window, or in your dreams. The Cincinnati Skyline Ketubah shows a dazzling night sky over water — a perfect romantic night to emphasize the beauty of the Cincinnati cityscape! 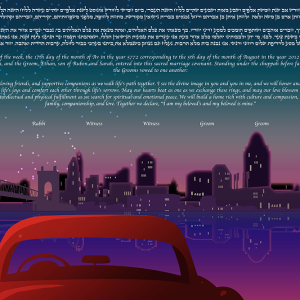 This Ketubah is perfect for the couple that is from Cincinnati or considers Cincinnati its’ hometown — a gorgeous design that captures your unique style, life, and love! Not only are both the lotus and the peony simply stunning, but they also hold an important symbolic meaning in many cultures — the perfect theme for a gorgeous Ketubah! 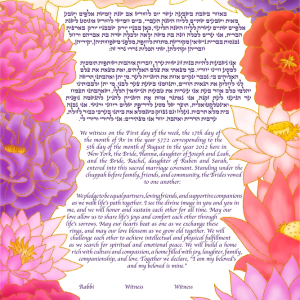 The Lotuses & Peonies Ketubah features both flowers in vibrant colors framing the Ketubah text. This gorgeous design reflects the beauty and excitement of your wedding day — a work of art that is truly bursting with life! The Lotuses & Peonies Ketubah is perfect for the couple that wants a more simple and subtle design, but with tons of color and energy! This Ketubah will pour light, love and happiness into your home — a daily reminder of your tradition and beautiful relationship! Not only is the Paper Crane simple and beautiful in its own right, but its creation goes far beyond being just a classic origami animal. Seen as a mythical or holy creature in Japan, fathers traditionally gave a thousand paper cranes as a wedding gift — a symbolic way of wishing the couple a thousand years of prosperity and happiness! 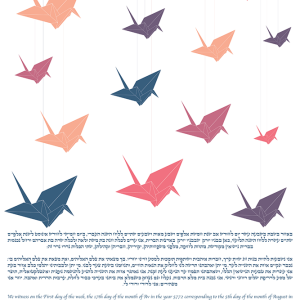 Rather than a thousand cranes, the Paper Cranes Ketubah contains eighteen birds, the classic Jewish number that also means “chai”, or “life”. With vibrant colors and a minimalist modern design, this Ketubah is perfect for the couple that loves Japanese style, or whose partner has Japenese heritage! The Paper Cranes Ketubah will be a beautiful symbol of your meaningful commitment, and a cornerstone of happiness, prosperity, and life! No matter if it’s the sun breaking over the buildings revealing a new day, or the dazzling lights and electricity of the night, no one can deny: there’s something completely magical about a city skyline! Part of our Skyline Series, The Washington Skyline Ketubah reflects the reverence for your favorite city and blends it with the soul of the Ketubah tradition. This gorgeous work of art captures all the pride and beauty of seeing that favorite skyline from afar — wether it’s from your bedroom window, or in your dreams. 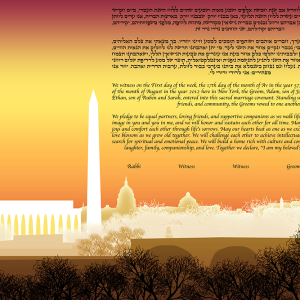 The Washington Skyline Ketubah features a vibrant sunset, fading from firey reds and yellows to bright pink. This design contains important and classic D.C. landmarks – the Capitol Building, the Washington Monument, and a gorgeous line of trees. The electric backdrop brings this Ketubah to life and makes the skyline truly pop! Wether you’re from the D.C. area or simply love the U.S. capitol, the Washington Skyline Ketubah will tie together your love, life, and style perfectly! With dazzling lights and cooler tones, the Under the Moonlight Ketubah is truly bursting with life, love, and spirit. This work of art features a mix of clouds, streaming moonlight, and beautiful stars to create an ethereal, and almost spiritual feel to the design. The bold lines form a simple circular framing around the Ketubah text to create a central focus and meaningful reminder of what the Ketubah represents. Whether its stargazing, kissing in the rain, or soaking up the sun — the beauty of nature has a way of connecting two people who are truly in love. 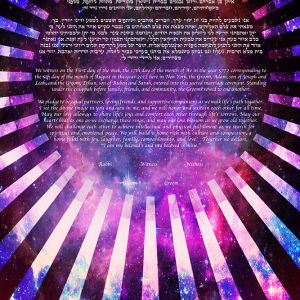 The Under the Moonlight Ketubah is perfect for the couple who are searching for a Ketubah that is both unique and stunning in style and significance. This Ketubah will reflect the magic and romance of your beautiful relationship — from first meeting and I Love You’s, to I Do’s and beyond. 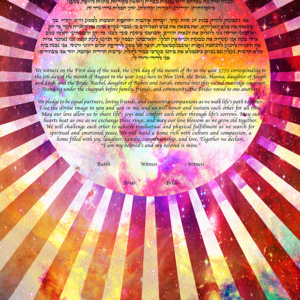 With dazzling lights and vibrant colors, the Under the Sunlight Ketubah is truly bursting with life, love, and spirit. This work of art features a mix of clouds, streaming sunlight, and beautiful stars to create an ethereal, and almost spiritual feel to the design. The bold lines form a simple circular framing around the Ketubah text to create a central focus and meaningful reminder of what the Ketubah represents. Whether its stargazing, kissing in the rain, or soaking up the sun — the beauty of nature has a way of connecting two people who are truly in love. 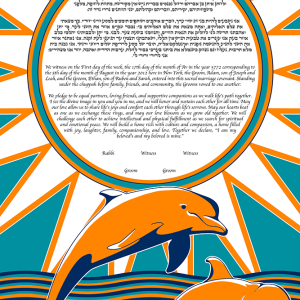 The Under The Sunlight Ketubah is perfect for the couple who are searching for a Ketubah that is both unique and stunning in style and significance. This Ketubah will reflect the magic and romance of your beautiful relationship — from first meeting and I Love You’s, to I Do’s and beyond. 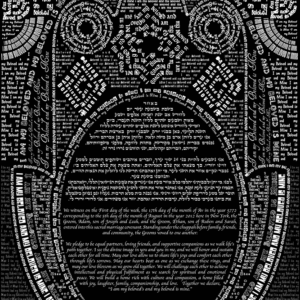 The My Beloved Monochromatic Ketubah brings Ketubot art back to basics utilizing a black and white typographic style and a unique design. This Ketubah exhibits powerful imagery and an even more powerful message — “I am my Beloved and my Beloved is Mine” or Ani le dodi ve dodi li. The words of this beautiful message work together to create an intricate pattern and the traditional symbol of a hamsa. This Ketubah contains both elements of complexity and simplicity. Although utilizing only a black and white palette, the My Beloved Monochromatic Ketubah is perfect for the couple that is searching for something that really conveys the importance and depth of the Ketubot tradition. The beautiful imagery and words of this Ketubah will be a symbol of your everlasting love for one another. 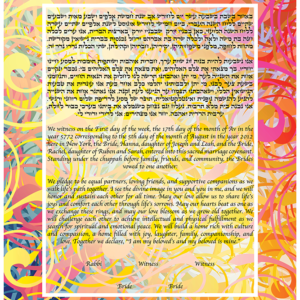 The My Beloved 1977 Ketubah brings Ketubot art back to basics utilizing a vibrant typographic style and a unique design. This Ketubah exhibits powerful imagery and an even more powerful message — “I am my Beloved and my Beloved is Mine” or Ani le dodi ve dodi li. The words of this beautiful message work together to create an intricate pattern and the traditional symbol of a hamsa. 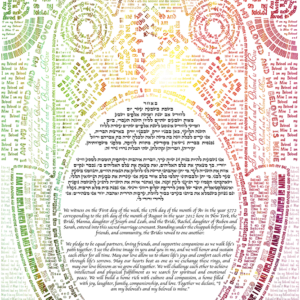 This Ketubah contains both elements of complexity and simplicity. Although utilizing a ombré style color palette, the My Beloved 1977 Ketubah is perfect for the couple that is searching for something that really conveys the importance and depth of the Ketubot tradition. The beautiful imagery and words of this Ketubah will be a symbol of your everlasting love for one another.